Alicia Sutton: We are broadcasting live for the Alliance for Continuing Education in the Health Professions. We are at their annual meeting in Orlando, Florida. I am delighted to have our keynote speaker with us this evening. Thank you for joining us. I am going to let you introduce yourself. Dave deBronkart: So, my name is Dave deBronkart and I didn't know anything about health care except it was something you got when you needed it until 11 years ago when I discovered that I was almost dead with stage 4 kidney cancer. I got a lucky shoulder x-ray for a stiff shoulder that, totally by coincidence, showed I had a tumor in my lung which ended up, long story short, my median survival diagnosis was 24 weeks. I was, what we call in Boston, wicked sick. And, by July of that year, I had actually survived. The treatment had finished, I got a treatment that usually didn't work and sometimes kills people, and the story of how I managed to survive by being an active partner with my doctors instead of sitting back and acting like I'm a car in a car wash. That's what my primary physician, Danny Sands, and I are going to be sharing tomorrow. We're going to be talking about some conceptual things but then we're going to actually role play two doctor visits that we had just before and after my diagnosis. Alicia Sutton: Dave, that's fascinating. That clearly puts you as the subject matter expert and patient all in one. Dave deBronkart: There is a sea change happening and it's, to a large extent, sociological. There are no technical obstacles preventing this shift. It's all a matter of people understanding that roles are changing. The shift is from the patient as a passive recipient of care to somebody who actually can contribute value. I don't just mean like in a Kumbaya-think lovely thoughts about patients sort of way. What we are finding is that when patients are actively involved and are responsible partners, that new things become possible that go beyond. The new whole is beyond the sum of the parts. So, Dr. Sands is one of the pioneers of this movement that we now call participatory medicine where, as the name suggests, it's a partnership. The work that he and I do as volunteers in our society for participatory medicine is education. We wake people up to the evolving roles. So, we'll be showing several different episodes and several teachable moments of how we actually conducted our case back in 2007 before this society existed. Alicia Sutton: Interesting. Do you think that that sea change, the speed of it, is somewhat enhanced by data? Meaning all of these health IT devices that patients wear and they own that data, and I wear a CGM for continuous glucose monitoring. So, I own that data, right? You own your data. Do you think that's contributing to part of it? Dave deBronkart: There's actually a big debate going on and something of a war in the industry about who owns that data. Exactly. Alicia Sutton: But patients have a sense, don't they, that some of that data is theirs? Dave deBronkart: Some do. Certainly, activist patient do, like social movement. There are strong parallels between this movement and the women's movement where, in the past, women were supposed to be grateful for what they were given. So, in 2007, I almost died and got better in less than a year. In 2008, it was like the video game of life had said game over except just at the last moment it said free replay. So, in 2008, I started learning about this. I mean, I really thought I was dying. I pictured my mother's face at my funeral and, instead, a year-and-a-half later, she and I got to see my daughter get married. Alicia Sutton: Isn't that amazing. Dave deBronkart: And now I'm a grandfather. The human cost when medicine falls short of its potential, the human cost, is extraordinary. Part of what we talk about is that this is not just about sort of patient's rights or listening to patients. Clinicians these days are overburdened. I was aghast to learn recently that there are 400 physician suicides a year in the U.S. alone. Alicia Sutton: It is pretty high, astronomical. Dave deBronkart: So, what if neither one of us has to be alone? What if we can share the work? But education is needed because nobody coming out of medical school these days was taught how to practice this way, where you develop the patient's competence. Alicia Sutton: Absolutely. Tell me a little bit more about the society itself. Dave deBronkart: So, sort of the progenitor, the early founding spirit of the society, was a doctor named Tom Ferguson who, back in the 1980s, published a magazine and then a book called "Medical Self-Care." People of a certain age may remember that back in the 60s there was a hippy book called "The Whole Earth Catalog;" how to build your own house, grow your own food. Well, when the second edition came out in 1994, 25 years later, Tom Ferguson was the medical editor of it. That just happened to be just as the web was being born. And Ferguson knew, when trouble hits, the main thing holding us back is access to information. Well, guess what the web gave us? Alicia Sutton: All of that information. Some bad information and some good. Dave deBronkart: Of course, exactly. Not in tomorrow's speech, but in many of my speeches, I point out, I mean who doesn't know there's garbage on the internet? I found my wife on the internet, on Match.com in 1999. We were one of their earliest success stories. But, before I found her, I went through some suboptimal search results. So, the great, subtle razors edge thing here is many doctors say, "patients stay off the internet, you don't know what you're doing." And yet, the vast majority of people do Google a symptom. 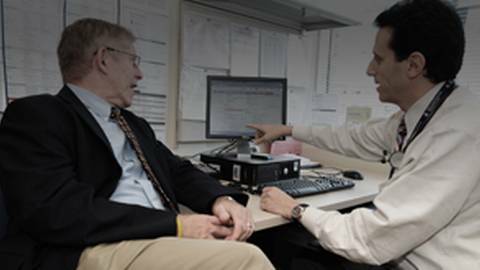 Dave deBronkart: So, if somebody is googling a symptom, it means they want to know more. They want to be more engaged in their care. If they're not good at it, do you smack them down and say "stay in the back seat" or do you develop their skills? That's exactly what needs to be taught. Alicia Sutton: I believe that. You're very good with your analogies and explanations. I am sure it's going to be a fascinating presentation tomorrow and we look forward to hearing the results for it. Where do you see things maybe about five years down the road in terms of patient involvement? Dave deBronkart: So, I'm glad you're looking there because you have to look ahead. An important obstacle to change, whether you're talking about women's rights, civil rights, or whatever, is that the elders tend to have been trained and brought up in the old view. One hundred years ago, a physicist named Max Planck got the Nobel Prize in physics for his work in quantum mechanics and at the end of his life, in his scientific autobiography, it had this terrific quote. When I first saw it, I was just aghast, and I blogged about it. He said a new scientific truth does not win adoption by convincing its opponents and making them see the light. It wins adoption because its opponents eventually die, and a new generation comes up that's familiar with it. Dave deBronkart: Tom Ferguson's friends, in 2009, got together and formed a society for participatory medicine. We talk about e-Patients; empowered, engaged, equipped, enabled. My internet nickname is e-Patient Dave, which I took on sort of just to publicize the term before we knew it was going to be a thing. Alicia Sutton: That's fantastic. What's the website that people can go to? Dave deBronkart: Participatorymedicine.org or you can just Google e-Patient Dave which is easier to remember, and I've got links to it. 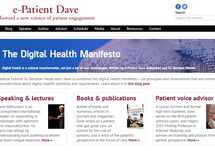 Alicia Sutton: Well, e-Patient Dave, we thank you so much for joining us and we look forward to your presentation and highlights. 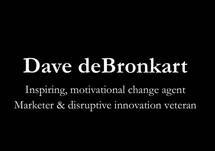 Dave deBronkart: Thank you and you might be one of us. Alicia Sutton: You're right. Thank you. Keynote speaker Dave deBronkart joins host Alicia Sutton to discuss the evolving roles in the patient and doctor relationship. From the annual meeting of the Alliance for Continuing Education in the Healthcare Professions in Orlando, Florida, keynote speaker Dave deBronkart joins host Alicia Sutton to discuss the evolving roles in the patient and doctor relationship. Better known as ‘e-Patient Dave’, deBronkart emphasizes key points in the shift from the patient as a passive recipient of care to one where the patient is an active contributor to his or her own care. deBronkart discusses healthy patient:doctor communication and ways clinicians can employ effective techniques. As a co-founder of the Society for Participatory Medicine and stage 4 kidney cancer survivor, deBronkart speaks globally on how patients should be partners in their care, rather than passive recipients, and how collaboration makes healthcare better for everyone.